Confused by digital, high definition and on demand? Find the answers in this basic guide, part of our series on the future of TV. People are not waiting for US TV shows to air in the UK, preferring to get them illegally online instead. 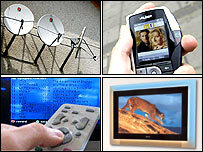 Almost half of people who regularly watch online video spend less time watching TV, a survey suggests. Mobile phone TV is coming of age - but will it really catch on? Is the first town to go digital prepared with one year to go?